If you need that extra push over the cliff… you know what to do? Go to Eleven. 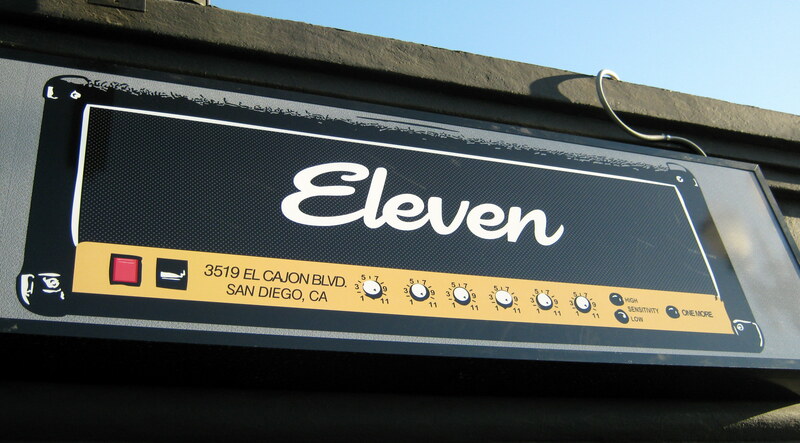 This awesome Spinal Tap reference comes in the form of San Diego’s newest bar from Scot Blair and Dennis Borlek, the guys who brought you beer bars, Hamilton’s Tavern and Small Bar with Louis Mello from Liars Club as their general manager. Radio Room, the location where Eleven now stands, looked like an empty shell compared to the newly renovated drinking establishment. Now plastered with old punk and rock posters from San Francisco and San Diego clubs of the 70s and 80s, including under the resined bar top. The stage, like a mini version of the Fillmore in San Francisco, is draped in red velvet commanding your respect for its artists. Like the Radio Room, and The Zombie Lounge before that, Eleven will have live bands with hopes of becoming what The Casbah was 15-20 years ago in its old location. Investment in a new sound system shows the owners’ commitment to Eleven as a quality music venue. Tonight will be their official opening night, although they have obviously been serving patrons for almost two weeks, with The Silent Comedy and The Donkeys filling the room with energy and mayhem. They still are squaring up a few things technology-wise, as their website currently only shows their logo and sadly, their bar cannot be found on Tap Hunter. So be patient or just drop on by for a few! Note: Photo credit to Jeff Hammett of the San Diego Beer Blog. I was there for 2 nights and didn’t take any photos. Lame on me.